Dave and Kathy Foreman celebrate two marriage dates. 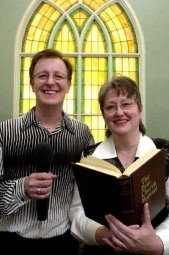 music ministry that grew out of it Re-Union Ministries. of human emotions and circumstances. A woman of few, but well-chosen, words, Kathy is the calm center of this relationship. Dave is super-charged, loquacious and full of enthusiasm. When they first met in Bluffton, they were considered “Jesus freaks,” Dave says. “That’s the term people used. It was the ’70s, and it was in the early days of contemporary Christian music. Dave had long hair and worked at a Christian coffee shop/book store called The Fishnet. she and Dave were introduced by a mutual friend, she had a young son from a previous marriage. moved him from Michigan to their farm near Poneto. ended up at Indiana Youth Center, the state correctional facility, at age 16. He finished high school there. That association led him to the Christian Center in Markle. dating. Some were employed; some were not. They had three working cars among them. “That was our first date, and I didn’t even know it was a date until it was over with,” Dave says. Well, maybe a little before that – he asked to hold her hand on the way home. Wayne’s near south side in 1992. Five years later, they separated. Kathy was blindsided – angry and devastated. “We just got back together and hoped it would work out, which was a big mistake,” Dave says. “I didn’t want to talk about it; I just wanted to put it behind us and go on,” Kathy says. They stayed together, uneasily, for a year. Meanwhile, Kathy struggled with explaining to others. feelings they had pushed below the surface of their relationship. there, but it was basically God doing what Kathy did, letting me know that I was still loved. prayers of this godly woman and God’s intervening on my heart,” made it happen. Since their remarriage, they have had training and do pastoral-care counseling. “We are not licensed counselors,” Dave says. “If we feel we’re out of our league, we send them elsewhere. They both enjoy the theater, eating out or just walking in the park. “We joke about being in a rut, but we like our rut,” Kathy says.